In nutrition, “roughage” is what you call all the cellulose and fiber present in foodstuffs that just shoot through your body without actually being digested. We’ve seen that an exception to this “boring” behavior can be found in the free-radical bromination of so-called “allylic” C-H bonds [See: Allylic Bromination]. The “allylic” position is a carbon that is adjacent to a double bond (not a C-H on the double bond itself! that’s a “vinylic” C-H). What’s the reason for this little trip down memory lane? Well, we’ve recently spent a little while going over the Friedel-Crafts alkylation reaction, and I don’t want to give you the impression that putting an alkyl group on a benzene ring is a synthetic dead-end. Alkyl groups don’t have to be inert! Like allylic carbons, alkyl groups that are adjacent to benzene rings are particularly reactive, and this can have all kinds of important applications. Benzylic oxidation – complete oxidation of an alkyl group adjacent to benzene to a carboxylic acid. 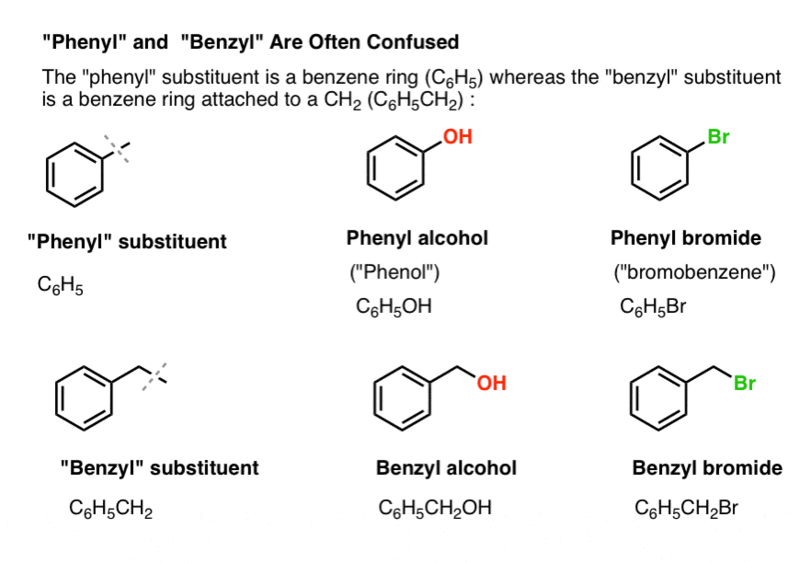 “Phenyl” vs “Benzyl” : What’s The Difference? A phenyl group (or phenyl substituent) is benzene minus a hydrogen: C6H5 . The carbons in the ring are phenyl carbons, and the hydrogens attached to phenyl carbons are phenyl C-H bonds. It’s analogous to vinyl (see above). A benzyl group is methylbenzene minus a hydrogen: C6H5CH2 . The carbon adjacent to the ring is the benzylic carbon, and the hydrogens attached to the benzylic carbon are called benzylic hydrogens. It’s analogous to allyl (above). Benzyl Radicals Are Stabilized By Resonance; Phenyl Radicals Are Not. The analogy of phenyl with vinyl and benzyl with allyl also extends to the stability of their radicals (as well as their carbocations and anions). Benzylic radicals are unusually stable since the orbital containing the radical can align with the pi-system of the benzene ring, just as in their allylic cousins (this is also true for benzyl cations and anions). Benzylic C-H bonds have bond strengths (aka BDE’s, or bond dissociation energies) of about 90 kcal/mol, which is considerably weaker than tertiary C-H (bond strength 93 kcal/mol) secondary C-H (96 kcal/mol) and primary C-H (100 kcal/mol) bonds. (Phenyl C-H bonds are about 113 kcal/mol, again reflecting the instability of phenyl radicals [ref]). Since bond dissocation energies reflect the ease of homolytic cleavage of the C-H bond (i.e. how easy it is to dissociate the bond into two free radicals) this is another way of saying that benzylic radicals are particularly easy to form, relative to other alkyl radicals. The reaction is selective for allylic C-H in the presence of primary, secondary, and tertiary C-H bonds due to the weaker allylic C-H bond strength (89 kcal/mol). Once formed (through “heat” or “light”, which initiates the reaction through homolytic dissociation of Br–Br), the bromine radical, Br• can break the weaker benzylic C-H bonds without touching stronger alkyl C-H bonds. For instance, here are the products of its reaction with toluene, and also isopropylbenzene. Note that ONLY the benzylic carbon is brominated. Everything else is left alone! When Does “Benzylic Bromination” NOT Work? Since the key to this reaction is formation of the (relatively stable) benzylic radical, benzylic bromination will fail on substrates where generating this radical via breaking a C–H bond is impossible. For example, look at the example below. 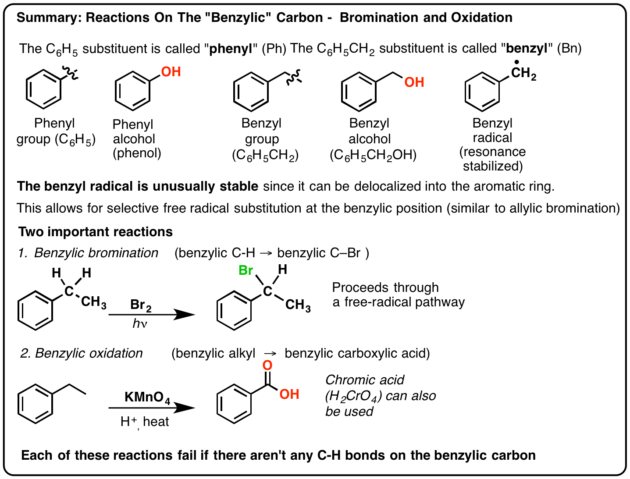 How can a benzylic radical possibly be generated when the benzylic carbon has three alkyl groups attached? It can’t – and the reaction fails. 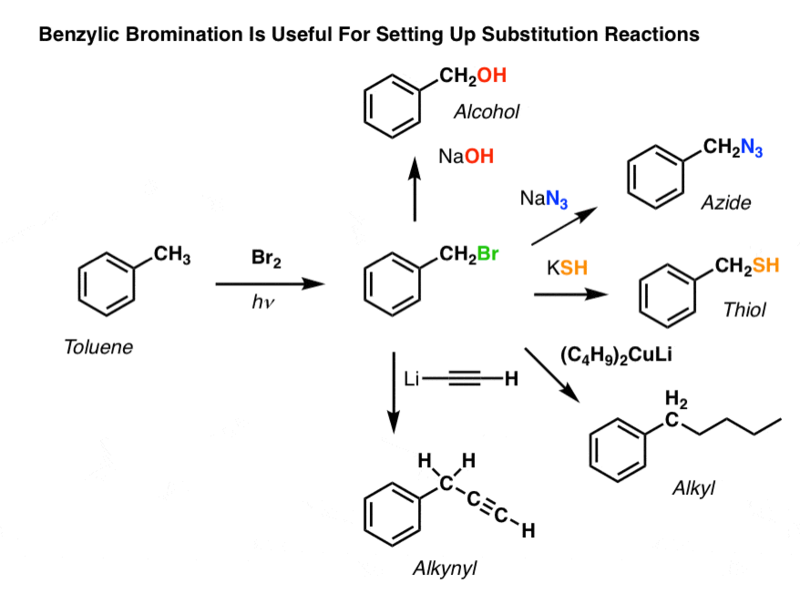 So why might benzylic bromination be useful? See how installing a good leaving group at the benzylic position gives us all kinds of options for installing various functional groups? Another example is the synthesis of styrene from benzene. At first glance, the most direct approach might seem to be the Friedel-Crafts reaction of vinyl chloride with benzene. 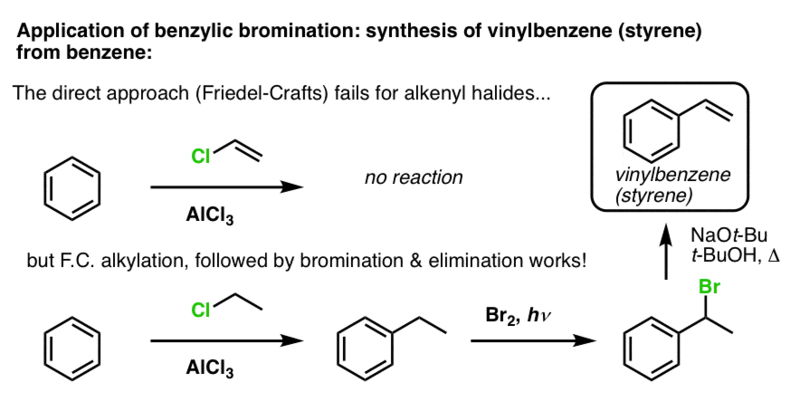 But the Friedel-Crafts doesn’t work for alkenyl halides (aka vinyl halides)! (vinyl carbocations are less stable than alkyl carbocations). Based on the above, here’s a quick quiz for you. How might you convert tetralin (below left) to naphthalene (below right)? Answer in the footnotes. Since the benzylic C-H bond is relatively weak, you might rightly ask if other types of reactions (besides bromination) can be performed at this position. They certainly can! A prime example is benzylic oxidation – where a benzylic C-H bond is broken and a benzylic C-O bond is formed. Now: there exist fairly gentle reagents for benzylic oxidation that are the chemical equivalent of tickling the C-H bond off with a feather, resulting in a benzylic aldehyde or ketone [the alcohol is an intermediate, but usually oxidized up to the aldehyde/ketone under these conditions]. That is not the type of benzylic oxidation that is covered in a typical introductory organic chemistry course! Instead, the main reagent for benzylic oxidation that is covered in most intro textbooks is hot potassium permanganate (KMnO4). Hot chromic acid (H2CrO4, which is formed by combining a dichromate salt like Na2Cr2O7 with a strong acid like H2SO4) can also be used for these purposes. KMnO4 is not subtle. KMnO4 is not gentle. KMnO4 is not kind. Hot KMnO4 will break every benzylic C-H bond and convert it into a C-O bond. From toluene, for example, the product is benzoic acid (a carboxylic acid). But it doesn’t just break the benzylic C-H bonds. Oh no. It goes after C–C bonds too; at least the ones that aren’t directly attached to a phenyl ring. For example, para-diethylbenzene is converted into para-benzene-dicarboxylic acid. Note that the alkyl C-C bond has to be cleaved off in order for this oxidation to occur! (it is likely oxidized all the way up to CO2 gas). An interesting variation is on a cyclic molecule like tetralin; the result is the dicarboxylic acid. this dicarboxylic acid is called phthalic acid. The full mechanism of benzylic oxidation is too complex, lengthy, and uncertain to show here, but the first step is almost certainly homolytic cleavage of the C-H bond by the Mn=O to form the benzylic radical. Benzylic oxidation with KMnO4 is a harsh reaction, but it can have its uses. It works best with simple molecules that don’t have delicate functional groups and can withstand some very rough treatment. The first thing to note is that carboxylic acids can’t be placed directly on a benzene ring via the Friedel-Crafts acylation, so alkylation followed by oxidation is a useful workaround. The second useful function in synthesis is the fact that benzylic oxidation converts an o- p- director (an alkyl group) into a meta-director. 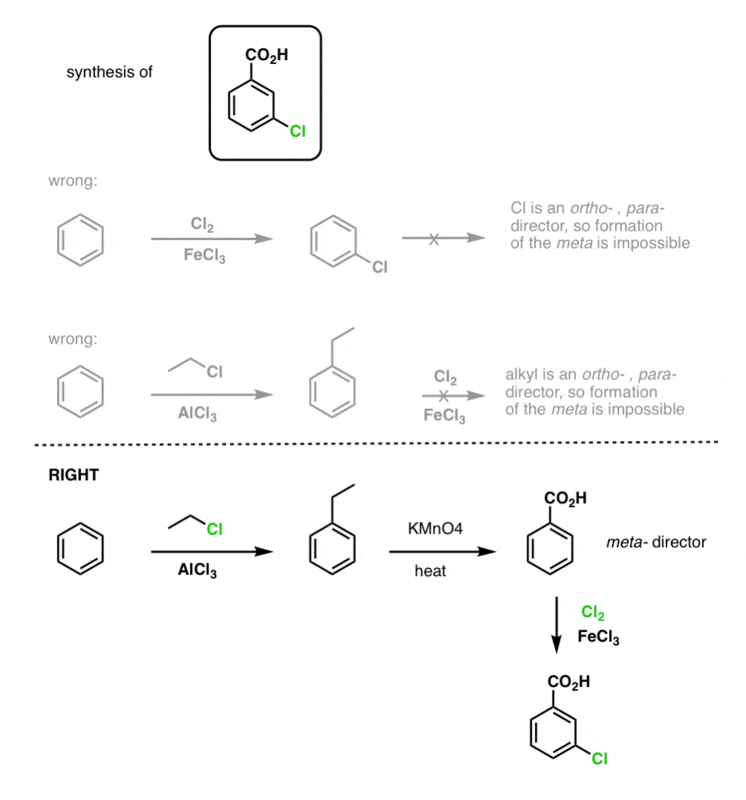 We’ll have a lot more to say about synthesis of aromatic compounds in a few more posts. [Note 1] “Cabbage” can also be used as a slang term in chemistry for “all that stuff on the molecule that you can safely ignore” for whatever reason. For instance, bryostatin is a beast of a molecule that shows promise as an anticancer agent. Trouble is, it takes a ton of a rare bryozoan to get a decent amount of bryostatin, and that isn’t enough for a clinical trial on humans. So several groups have been working on making simpler, easier to synthesize “bryologs” where they get rid of the “cabbage” that isn’t essential for antitumor activity. 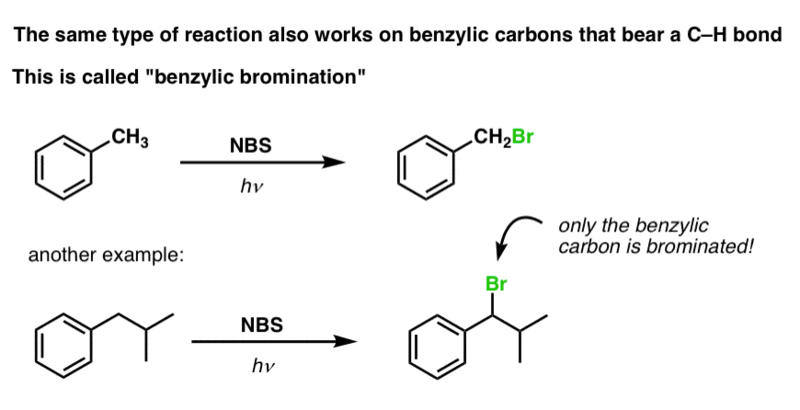 [Note 2] Br2 will generally not react with aromatic rings without a Lewis acid catalyst. However if a strong activating group is present (such as OH, NR2, etc) some bromination of the ring can occur, especially at elevated temperatures. Fun fact: “Benzylic oxidation” is the answer to the puzzle of why methylbenzene (toluene) is not nearly as potent a carcinogen as benzene. That’s because your liver has cytochrome p450 enzymes (containing high oxidation-state iron species) that can oxidize the benzylic CH3 group to the more water-soluble carboxylic acid, allowing it to be cleared by your kidneys. [Note 3] This requires two oxidations and two eliminations. A cautious way to do it is to oxidize (i.e. brominate) once, and then eliminate to give an alkene. 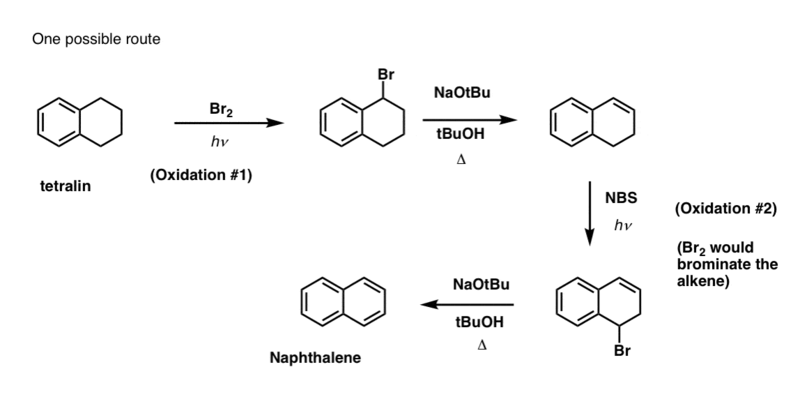 The alkene could then be subjected to bromination again (using NBS, so as to avoid bromination of the double bond) to give another bromination (benzylic bromination product shown here, but allylic also feasible) which could be treated with base to give aromatic naphthalene. 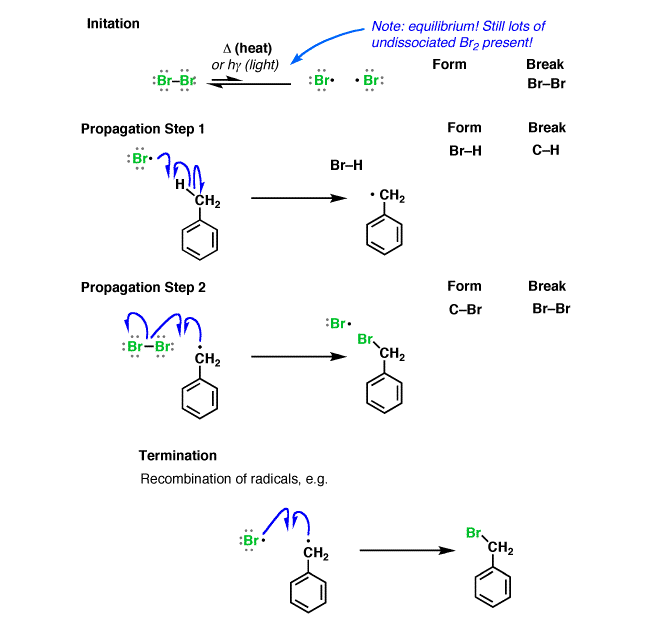 (in practice, it turns out that both brominations can be done at the same time using Br2 at high temperature. Treatment with base can then yield naphthalene). [Note 4] Answer to quiz question 2. – under this title: “oxidized up to the alcohol/ketone” – it should read “aldehide/ketone”. Definitely a worthy topic to discuss. Thank you, James. A couple of notes though. For the fairness sake, I have to note, that when the benzylic hydrogen is not available, the radical brominatiln with NBS is still quite possible, won’t give you the substitution at benzylic position, but still the reaction does occur, so it might be misleading saying that it fails completely and there’s no reaction. When it’s done with t-Bu-Ph, it also gives a radical rearrangement that in fact does yield the benzylic radical. Also, I believe you’ve mentioned in one of your previous posts that FC alkylation often yields multiple alkylation products and is generally not a good reaction for the actual synthetic purposes, yet you use it here as the first step in your synthesis. Tut-tut ? 1) I was not previously aware of the neophyl radical rearrangement. Thank you. 2) Guilty as charged re: the FC alkylation. Good point. I wonder if it is possible to obtain a good yield of mono alkylation product by using a large excess of benzene? A professor claimed that in at least one class. In that case the reaction might work fine for simple synthesis like making toluene. Or something else awkward like formylation/reduction or carboxylation/reduction. Or organometallic transformation that few students have learned. I’ve read that the radical bromination of primary carbon isn’t as effective as the corresponding chlorination. With the fairly low concentration of Br2 created by NBS, which result in an even lower concentration of Br radical, is it possible for NBS to brominate the primary carbons? For example in such compounds as t-butyl benzene, ethane, & neo-pentane?